Take without water!. 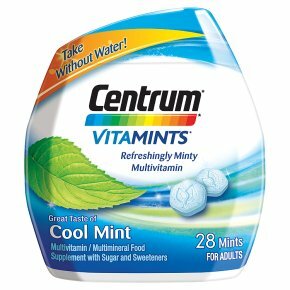 Refreshingly minty multivitamin. Vitamin B6 to support energy release. Vitamin D to maintain immune function. With a balanced blend of 17 key nutrients. Directions for Use: Chew two mints per day. May be taken without food or water. Do not exceed the daily recommended dose. A healthy lifestyle and a varied and balanced diet are important. This product should not be used as a substitute for a varied diet and healthy lifestyle. If taking other supplements, please read the label as they may contain the same ingredients. If you are pregnant or breastfeeding, consult your doctor before taking this product. This container is sealed for your safety. Do not use if the foil is broken. Always replace the lid after use. Excessive consumption of Isomalt may produce laxative effects.<br><br>Store out of sight and reach of young children.